The Ritz-Carlton Ras Al Khaimah, Al Wadi Desert and The Ritz-Carlton Ras Al Khaimah, Al Hamra Beach have launched a season of exceptional dining experiences and epicurean adventures that will entice even the most discerning palates. Nestled in a scenic nature reserve, The Ritz-Carlton Ras Al Khaimah, Al Wadi Desert is a secluded oasis set amongst 500 hectares of desert conservation area. Since launching as a Ritz-Carlton resort in 2017, the hotel has focused on offering exceptional dining experiences with unparalleled service for guests, whilst being committed to providing traditional Arabian hospitality. Overlooking the Arabian Gulf, The Ritz-Carlton Ras Al Khaimah, Al Hamra Beach, is an exclusive island-inspired resort with just 32 villas perfect for those seeking privacy and seclusion. The signature poolside restaurant, Shore House overlooks the Northern Emirate’s pristine coastline and combines rustic charm with exclusive and intuitive Ritz-Carlton service. The season kicks off with the relaunch of the iconic Night Brunch at Farmhouse, the only evening brunch in Ras Al Khaimah. Since launching in February this year, the Night Brunch has become one of Ras Al Khaimah’s most feted dining experiences. The food is served family-style and includes Farmhouse specialties such as the Smokehouse Chicken Wings with BBQ Glaze, Braised Meat Balls served with Truffle Sauce and Manchego Cheese or Crab Sliders with Mango Chilli Salsa, Garlic Aioli and Coriander. 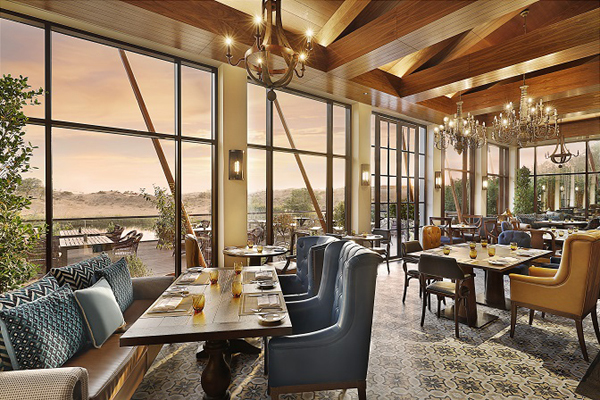 Guests will also enjoy specially selected authentic, local produce including grilled meats and premium farm-grown accompaniments in a vintage-inspired al fresco décor surrounded by spectacular desert landscapes at the heart of the Al Wadi Nature Reserve. The evening is perfectly accompanied by a live, smooth jazz saxophone performance under the stars. The Farmhouse Night Brunch: Every Thursday, 6.00 pm – 11.00 pm Dh325 ($88.4) per person, inclusive of the all-new family-style menu or Dh450 ($122.4) per person with house beverages. With the weather cooling, guests are invited to enjoy The Ritz-Carlton, Al Wadi Desert’s destination dining experiences. Enjoy an epicurean adventure of dining amongst the sand dunes whilst enjoying the cuisine and hospitality of the Bedouins under the stars and feasting on seafood, meat and lighter fare. Ladies are invited to an upbeat evening including two complimentary glasses of bubbly and canapés at the scenic Moon Bar which boasts stunning vistas of the watering hole which attracts Arabian gazelles, Oryxes and other wildlife. With a stunning coastal backdrop, Shore House offers a casual poolside dining experience with rustic charm, showcasing the freshest seafood and international cuisine. The new lunch concept ‘Table For Two’ includes a choice of starter and main course from a selected menu with unlimited house beverages. Highlights of the menu include the Kale and Fig salad or Fijian Ceviche to start, followed by Grilled Lobster or Charred Marinated Octopus. Guests are then invited to relax whilst watching the sunset and sip on a refreshing creation by the resident mixologist. Sundays to Thursdays, 12.30 pm – 4.00 pm Dh250 ($68.0) for two people, inclusive of unlimited house beverages selection for one hour. Sushi enthusiasts can enjoy a feast of unlimited maki rolls and miso soup prepared by the resident sushi chef accompanied by a selection of blends and fruit-based creations crafted by the team of mixologists.